POUR 1/4 cup of the dressing over chicken in shallow dish or sealable plastic bag; cover. REFRIGERATE 30 minutes to marinate. Remove chicken from dressing; discard dressing. 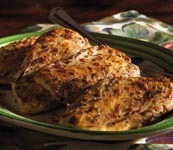 PLACE chicken on rack of broiler pan 4 to 6 inches from heat. Broil 7 to 9 minutes on each side or until cooked through, turning and brushing with remaining 1/4 cup of dressing. Serve with rice. Easy Cleanup Line bottom of broiler pan with foil. Spray rack of broiler pan with cooking spray before topping with chicken.